Root canal treatment is a dental procedure commonly used to treat infected or necrotic teeth. It offers an alternative to having the troubled tooth extracted, provided that the root canal system is accessible with reasonable negotiation as close as practicable to the end of the root. The tooth also needs to have an adequate amount of remaining tooth structure and good surrounding bone support. 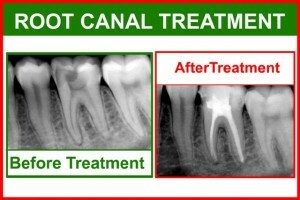 Why do teeth need root canal treatment? This entry was posted in Endodontic treatment and tagged dens evaginatus, dental infections, flossing, good oral hygiene, Gum Disease, periodontal disease, root canal treatment, talon's cusp, toothbrushing on November 28, 2010 by leekong.